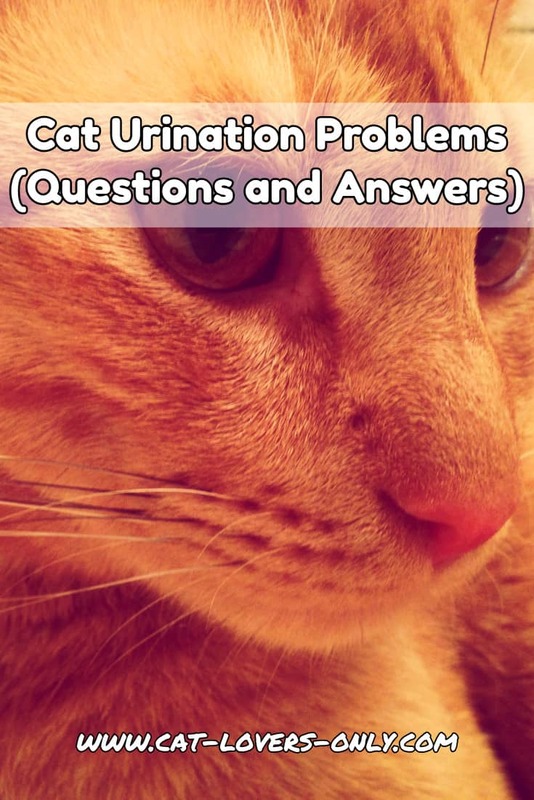 Need Help Solving Cat Urine Problems? Cat urine problems leave your house smelling bad, and you and your cat at odds. In order to resolve them, it's important to understand that there are two main types of urination problems in cats. The first falls under what we'd call inappropriate urination, and the second is what's often referred to as spraying or marking behavior. The causes of these two types of problems are different, and the solutions are different as well. The first step, then, in dealing with urine problems in cats is to determine which of the two main problem types we're dealing with. Only then can you begin to solve the problem. Submit your question on cat urine problems. 1. Many cats will urinate outside the litter box in response to a medical problem. The problem could be related to the urinary tract, bladder, or kidneys, or it could be something completely unrelated (such as diabetes). 2. Another key factor is stress. If something is wrong in your cat's world, this can throw him or her off the box. 3. For male cats, a blockage is life threatening. If your male cat stops urinating, please seek veterinary advice as soon as possible. 4. Encourage your cat to drink more water. This is important because many cats don't drink enough and are often chronically dehydrated. Keep food and water bowls a fair distance from each other. Get a drinking fountain as cats tend to prefer moving water over still water. 5. Monitor your cat. You can't know what your cat's situation is unless you use clumping litter and scoop the litter box often. This will keep you on top of your cat's urine habits. How often should cats pee? There's no definitive answer for this as it varies based on how much water is consumed, whether or not your cat eats wet or dry food, level of exercise, and other factors. Generally speaking, though, anywhere from two to five times a day is within the normal range for most cats. It's important to learn what's normal for your cat, and then watch for changes. If your cat suddenly starts producing less urine volume, this may be a sign of trouble. My cat's urine seems to be pink or red. Why is that? Some medications or supplements can alter the color of urine. But, if you see light red or pink urine, or even a dark red or brown color, there may be blood in your cat's urine. There are various possible causes for this, but it takes a veterinarian to diagnose the problem, and your cat may stop using the litter box until the problem is solved. Sometimes, it takes more than one vet visit, as was the case with Sage's feline idiopathic cystitis. FIC is inflammation of the bladder where the cause is unknown. How long can a cat hold their urine? According to All Feline Hospital, cats can hold their urine for a surprisingly long time, up to 24-48 hours. My cat hasn't peed all day, should I call the vet? If the day comes when my cat hasn't urinated in 24 hours, I'll assume something is wrong and call the vet. I usually clean the cat box two to three times a day, and I always make sure that my cat is urinating regularly. Again, I can't emphasize enough the dangers of blockage in male cats. My cat seems to be urinating a lot more than usual. Why? If your cat's urine output increases, your cat may be ill and needs to see the vet. Diabetes and hyperthyroidism are two of the diseases that can cause excessive thirst and urination. Have A Cat Urine Problem? Is your cat urinating outside the litter box? Which cat has orange pee? Why is my cat urinating outside litter box? Constant urine outside of box yet using box too! Blood and Slimy White/Yellow Stuff? Male cat is peeing everywhere? My cat pees on the rug while we sleep! Multiple cats urinating and marking? My cat gets in the litter box and pees outside of it!